There has been increasing awareness within the climate movement about the relationship between food, land use, and climate. A 350.org flyer urges “put plants on your plate”; a draft of a Climate Mobilization document wants “a reduction in meat-based consumption.” These are steps in the right direction, but we need to do better than this. The climate situation is much more serious than we thought and radical solutions are now absolutely necessary. Most people understand that we need to stop the use of fossil fuels to deal with climate change. But most of us have not fully figured in the land use effects of livestock agriculture on climate. Think about it: plants take up carbon dioxide. Animals breathe out carbon dioxide. Carbon dioxide is a greenhouse gas. Land use (mostly livestock agriculture) has greatly decreased plant life and increased the mass of large animals on the planet. When you add in the methane from cattle, it is likely about half of the total climate problem, as Goodland and Anhang argued in 2009. The land use effects of livestock agriculture are colossal. Vaclav Smil and Karl-Heinz Erb et al. have estimated that humans have destroyed about half of the total plant mass on earth. This net vegetation loss contains more carbon than humans have put into the atmosphere since 1800! At the same time, the biomass of large animals on the planet (mostly our livestock) has increased seven-fold in the last 500 years. So plants are being decimated, while animals are overrunning the earth: what effect do you think this will have on the climate? Believing that we can alter the biosphere on such a scale without affecting the climate is delusional. Even replacing current fossil fuel usage with renewable energy will be a lot harder than we imagine and involves major cultural changes. Many environmental activists think that building out solar and wind power will deal with the problem. How realistic is this? In addition to the time, energy, and expense of building out solar and wind power, we will have to build out battery backup capability for renewables, we will need to convert our economic infrastructure to run exclusively on electricity (renewables produce only electricity), and we will need to vastly expand the electric grid. All of this is technically possible; but it will make a huge dent in the consumer economy for decades, and will likely leave us with less energy in the end than we have today. Vegans are well positioned to lead in this regard. Vegans are already thinking about social and cultural change — though so far, mostly in terms of food. Much of the rest the climate movement is still thinking in terms of “green growth”; just build large numbers of solar panels and wind turbines, and we can go back to business as usual. We can do this, but “green growth” is not going to happen. We need to educate ourselves (our fellow vegans) on these issues, address the rest of the environmental movement, and then go on to engage our nation, our continent, and our world. Lifestyle and cultural modifications are essential, not just with food, but more generally so that our massively overconsumptive society can live on less. There are several relatively easy things for vegans to do. 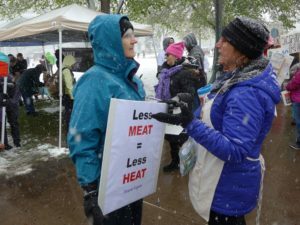 Vegan groups everywhere could encourage their supporters to show up at whatever climate marches are held this year. We can also educate ourselves about climate issues through speakers and study groups, and try to engage environmental activists in dialogue about diet and climate. We may not make everyone vegan, but we need to encourage and support them to make deep reductions in animal product consumption. We need to build vegan communities that can undertake these various actions. Let’s resolve that in 2018, vegans will take the lead in climate change action. Thanks Keith. Excellent points. I have forwarded it to my Longmont friends, asking them to read and comment back to me. They have read The China Study – are Catholic – and eat meat/ dairy. We all do what we can! In similar situations I try to keep the conversation open and keep feeding them information.